Known as both the Amerigo Vespucci Airport and also the Peretola Airport, the city's airport can be found around 4 km / 3 miles to the north-west of Florence (Firenze). Close to Campi Bisenzio, San Mauro and Sesto Fiorentino, Florence Airport lies within Italy's acclaimed Tuscany region. Peretola has recently undergone considerable improvements, increasing capacity to some 2.2 million annual passengers at a cost of more than 11 million. Buses at Florence Peretola Airport are operated by ATAF ad SITA, and link the city centre and both the Florence SMN Railway Station (Firenze Stazione SMN) and the Prato Railway Station (Prato Stazione FS). Passengers will find the airport's taxi rank directly outside of the arrivals terminal, where taxis travel into the historic city centre of Florence (centrol storico) in around 15 minutes. Other notable districts connected by taxis include Campo di Marte, San Giovanni, Santa Maria Novella and Santo Spirito Oltrarno, which is centred around the Piazza Santo Spirito. The city of Florence lies within Italy's beautiful region of Tuscany and is known in Italian as 'Firenze'. 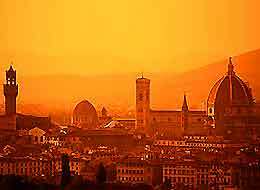 Florence's skyline is dominated by the stunning 13th-century Duomo, which is actually the world's fourth biggest cathedral and a truly magnificent sight, with a hard-to-miss brown-tiled dome. Extremely close to Amerigo Vespucci Airport (FLR), many of the attractions in Florence grace the banks of the meandering River Arno and attract literally millions of tourists every year. The sights of Florence can be overwhelming and are often based around the Piazza del Duomo and the Piazza della Repubblica.